Is this dog a better drummer than Lars Ulrich? You decide! with the best thing on the internet today! Wonder if he could play another pedal with his tail? Take notes on the matching shades/drum wrap. While most people will recognize Travis Barker from Blink-182, he had a two year stint previously with The Aquabats, a hilarious ska band which dresses up in costumes and sings about magic chickens and pool parties. Check out the full show from 1998 below. Chad Smith plays “My Friends” on Letterman with a broken arm. Chad Smith had to play one handed because of a broken arm, acquired in a baseball game. He doesn’t even miss a beat. Can you play a Blink-182 song on drums? Maybe. Could you play a Blink-182 song with your dominant foot broken? Probably not. SledgePad is a fairly new company based in Georgia (buy American!) making acoustic treatment for bass drums. They currently make 3 models. The full size SledgePad (pictured above) is 23″ on the batter end and tapers to 12″ on the reso head. Pretty heavy dampening, but a warmer, fuller tone than a pillow. 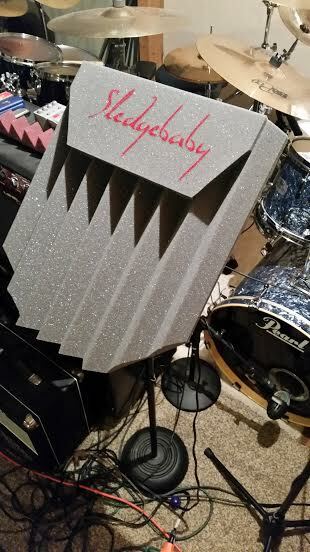 The SledgeBaby is the same design but about 30% smaller for drummers that like less dampening and also for 20″ and 18″ bass drums. The Sledgpad Alien has more airflow through and around the pad to allow the drum to speak longer and not muffle the drum’s natural voice. The Alien lays inside the drum in a V shape and exposes the bottom of the shell and looks like a space ship (thus The Alien). The attack sounds great and allows the drum to really speak. All 3 Sledgepad models are less weight and mass than a pillow and allow more air movement. Each pad is slightly over sized and when you install SledgePad the pad will squeeze in between the heads and will ad hear to the heads with small double sided tape tabs. That inner tension along with the type of material and the design shapes the sound and creates a couduit that allows the drum and heads and pad to work together very nicely. Cons: Tape may un stick during heavy travel for gigging. Easy problem to fix, but keep an eye out. Holding it down on a beautiful DW kit; he even manages to grab a different stick without changing the beat. All and all, well done from the host of Late Night. Dog plays drums, adorableness ensues.